Just finished watching the Democratic debates on ABC. Before I get to the particulars of whom I think won and who benefited I have to say I really like the format and I like ABC news’ moderation of the debate. It was a nice change and you didn’t see the snide and snarky jabs meant to poke and prod a knee jerk reaction like Tweety might have tried. Gov. Bill Richardson: I thought he gave a killer answer on Charlie Gibson’s “what do you say to the surge working now” question. The Gov. pointed out the surge was supposed to create an environment for government viability. That still hasn’t happened and ask the ones who’ve come back maimed and wounded and those who have lost a love one whether or not the surged mattered. He certainly won’t catapult himself ahead of the to others but he certainly positioned himself to be a possible candidate for the VP spot. Hillary Clinton: She certainly embraced the “change” meme this evening in contrast to the “experienced” frame she’d been pushing and helped her a third place finish in Iowa. I’m still somewhat dismayed at how she could push the same exact message George H. Bush pushed in his run for re-election in ’92 and could only standby while, then Gov. Clinton just blew that off and pounded on his theme of change. The effect of 9/11 is still reaching into the campaigns of some of the candidates and pushing them into wrong conclusions. The latest issue of Time has their post Iowa issue out describing a campaign organization in stunned disarray as Mark Penn, the head campaign advisor for Ms. Clinton is drawing the most criticism for taking the campaign meme in the “experience counts” direction. Mark Penn is an odious figure for so many other reasons outside the scope of this post here but suffice it to say the inevitability sheen and luster is long gone off the Clinton juggernaut. I don’t think she hurt herself this evening and even had one of her better performances, but she did get somewhat defensive when Edwards and Obama tag teamed her. Overall, she didn’t do anything earth shaking to help her stem the bleeding caused by Iowa. I don’t see Hillary making it if she doesn’t win New Hampshire. Bill Clinton lost to Paul Tsongas in the ’92 New Hampshire primary coming in second after his poor performance in Iowa. 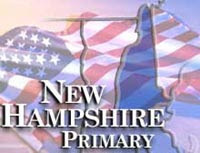 But proclaiming himself the “Comeback Kid” propelled him out of New Hampshire with enough momentum to take the nomination. I don’t think this will work for Hillary though she’ll try to claim it if she can finish above Edwards. She has to win it. Former Sen. John Edwards: My candidate of choice had the best performance of the debate I thought. Having said that I still don’t think he did enough to overtake Obama. He did go after Hillary and did a fairly nice job of making a case that it would now be a two way race between himself and Obama. There is no doubt he needs to take her down before he can fight Obama and this evening he just may have made his case and succeeded if Hillary hasn’t stopped the bleeding. Senator Barack Obama: He needed to not make a mistake this evening to hold the Iowa victory buzz and he pretty much succeeded. The thing about him though is the fact he is fresh and he’s different than the bald, old white guys that have trodded this path before him. He frames his rhetoric in a different language, language that connects with the young 18 – 35 year old first time voter. His eloquence and articulate mastery of the spoken word is a major asset. This will be the second contest where independent voters can cross over and vote in the party primary of choice. He only beat Hillary by 1% point among Democrats in Iowa. From here on it will be interesting to see how well he does when the caucuses and primaries are closed to Democrats only.